Electronic Caliper without output, 0-6"
Electronic Caliper without output, 0-8"
Electronic Caliper without output, 0-12"
Starrett's new 799 Series Electronic Calipers are light, comfortable, easy to use, and constructed with features that have made Starrett Slide Calipers the machinist's first choice for many years. They have a slim, streamlined profile, function buttons for zero and inch/mm, a large, clear, easy-to-read LCD display, and long battery life. 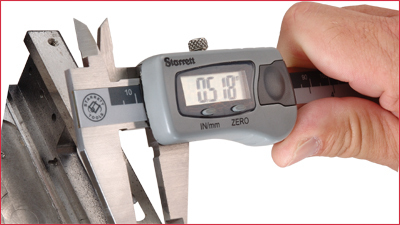 799 Calipers are a Starrett Global Series Product and are available in 0-6", 0-8", and 0-12" models, and furnished in a fitted, protective case. While the Starrett brand is synonymous with “American Made”, we have manufactured products worldwide for nearly 50 years. These products are available in the U.S.A. and identified as “Global Series”. Regardless of country of origin, the Starrett brand remains your assurance of unmatched precision, quality and value.